The tube-nosed seabirds comprise several families of pelagic birds, most of which seek food from the surface layers of the sea. The tube-nosed seabirds range in size from the 6-inch Least Storm Petrel to the huge Wandering Albatross, which has a wingspan of nearly 12 feet. All have tubular nostrils and a distinctly hooked bill. The plumage is dense and waterproof, and beneath the outer feathering is a dense coat of down. A large gland that concentrates and excretes salt in drops from the bill resides in the roof of the orbit. Most species have long wings, held stiffly and used for soaring and planing over the waves, but the storm petrels flutter close to the surface on shorter wings, and the diving petrels of the Southern Hemisphere have very short wings, which they use for locomotion under water, as do small shearwaters. Diving petrels are convergent in morphology and ecology with the unrelated auklets of the Northern Hemisphere. Tube-nosed seabirds are clad in black, white, brown, or gray and show little bright color except in the bill and feet of some species. Generally monogamous, males are larger than females. Small species nest in burrows; large albatrosses and some petrels nest on the surface. All lay only one egg and have long incubation and nestling periods. The young are densely downy. Tube-noses have a well-developed sense of smell, which some species use to find their nest burrows at night. Both parents and young squirt foul-smelling stomach oil at intruders. 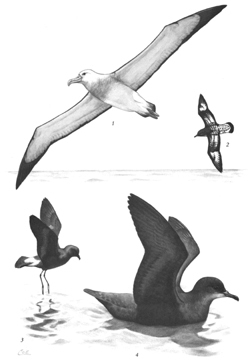 Figure A–5 Tube-nosed seabirds: (1) Wandering Albatross (Diomedeidae); (2) Cape Petrel (Procellariidae); (3) Wilson’s Storm Petrel (Hydrobatidae); (4) Short-tailed Shearwater (Procellariidae). Diving petrels are members of petrel clade of the Procellariidae. Shearwaters and petrels form two distinct clades. Storm petrels divide into two distinct family level clades. Kennedy, M., and R. D. M. Page. 2002. Seabird supertrees: Combining partial estimates of procellariiform phylogeny. Auk 119: 88-108. Nunn, G. B., and S. E. Stanley. 1998. Body size effects and rates of cytochrome b evolution in tube-nosed seabirds Mol. Biol. Evol. 15: 1360–1371. Penhallurick, J., and M. Wink. 2004. Analysis of the taxonomy and nomenclature of the Procellariiformes based on complete nucleotide sequences of the mitochondrial cytochrome b gene. Emu 104: 125-147.